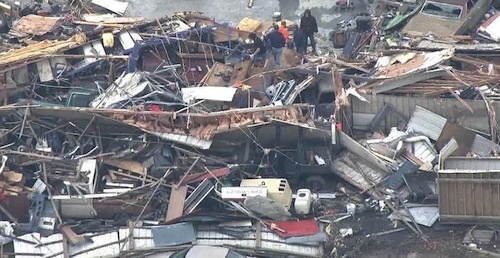 A total of 22 tornadoes ripped through the states of Illinois, Missouri, Tennessee, Indiana and Iowa on Tuesday, killing at least 3 people and injuring truck drivers and motorists as vehicles were scattered across a Missouri highway. Meteorologists are warning that the severe weather will continue to spread across the Midwest towards eastern states through Wednesday leaving close to 100 million people at risk. Linda Maguire had also been driving along the highway on her way back to school in Murray, Kentucky and just after she got a message from her dad warning her about the storm, she came upon the tornado’s aftermath. “Right as he told me, I saw a tractor trailer was flipped over right off the side of the road. I saw two or three of them, and two cars in front of me were at a complete stop. The tornado had just passed. There were cars scattered all over the highway and the hills looked like a scrap yard,” she said. J.R. Wright was also driving through Perryville when he came upon what he characterized as “a disaster zone.” He parked his car on the side of the road wanting to see what he could do to help people. He said that as soon as he got out of his car all he could hear were “people screaming and crying” everywhere. “There were two or three women running up and down the road looking for their husbands,” he said. The tornado claimed another man’s life in Ottawa, Illinois, after being struck by a falling tree. Ottawa Police said several other residents in the town were injured, homes destroyed, power lines down and numerous gas leaks. Tragically, another man was killed in the nearby Village of Crossville, Illinois where authorities found him in a field behind his heavily damaged home. The man’s wife was also severely injured and was taken to a local hospital. According to the National Weather Service center, thunderstorms are expected to spread across the Ohio and Tennessee Valley region and stretch into southern New England through Wednesday afternoon. Residents and drivers traveling through the regions are being warned about severe weather including damaging winds, tornadoes and hail. We were in Cuba, Missouri Tuesday night, Wednesday morning, and it was still very windy in the morning. I heard someone yelling "Help!" Over and over, from somewhere back behind the truck stop. A short while later, the ambulance went by with the lights and siren going. Why didn't you go see if you could help ? I was parked just south of there Tuesday night at the Truck parking area. I saw the aftermath Wednesday morning. I was down In Hayti and exit 19, it was almost as bad Down there. 1 truck was blown over headed south not far from the 19exit and several more in the next 20miles. Guess where I am till tomorrow afternoon? Lol....Dekalb,Il. I'll tie the truck down. That looks bad. Tornados in Ohio too ! !